Crop development and growth involves several processes whose rates are affected by changes in temperature. The net result of warming on crop yields is positive in some locations, namely regions where current temperatures are cool relative to the crop's optimum, such as wheat in much of Canada and China, maize in the northern extremes of the USA, or rice in northern Japan. Yet for most locations where major cereals are grown, and nearly all locations within developing countries, warmer growing seasons tend to result in less suitable conditions and lower yields (Ramankutty et al., 2002; Lobell and Field, 2007). Among the key reasons for this are faster rates of crop development and soil and canopy evapotranspiration (ET) as warming occurs, with the latter resulting in elevated water stress. Though most cropping systems exhibit a clearly negative yield response to warming, the precise amount of yield loss per degree warming is often not tightly constrained, either from theory or observations. For example, Fig. 3.1 displays estimates of rice yield loss for different amounts of warming in China and India, as estimated by several crop modelling studies. Substantial differences between studies are evident, with as much as a factor of two in some cases. Similar levels of uncertainty are also often seen when evaluating temperature responses from statistical data. 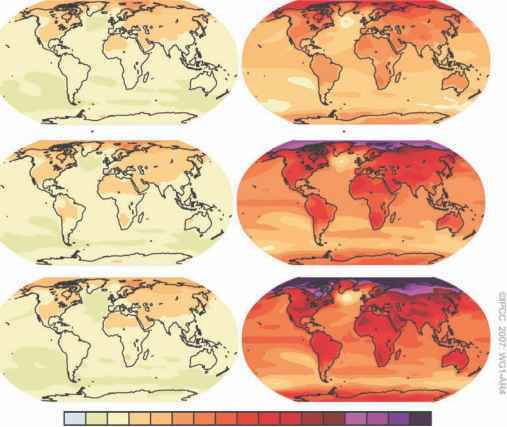 For example, in a study that projected yield impacts in 2030 using time series data and climate model projections for developing countries, the uncertainty in temperature sensitivity was often the single most important source of uncertainty in projecting future impacts, surpassing even uncertainties in future temperature or precipitation change (Lobell and Burke, 2008).